From the moment I discovered I could dress up, act weird, and an audience would be forced to watch, I knew I had to be an actor. 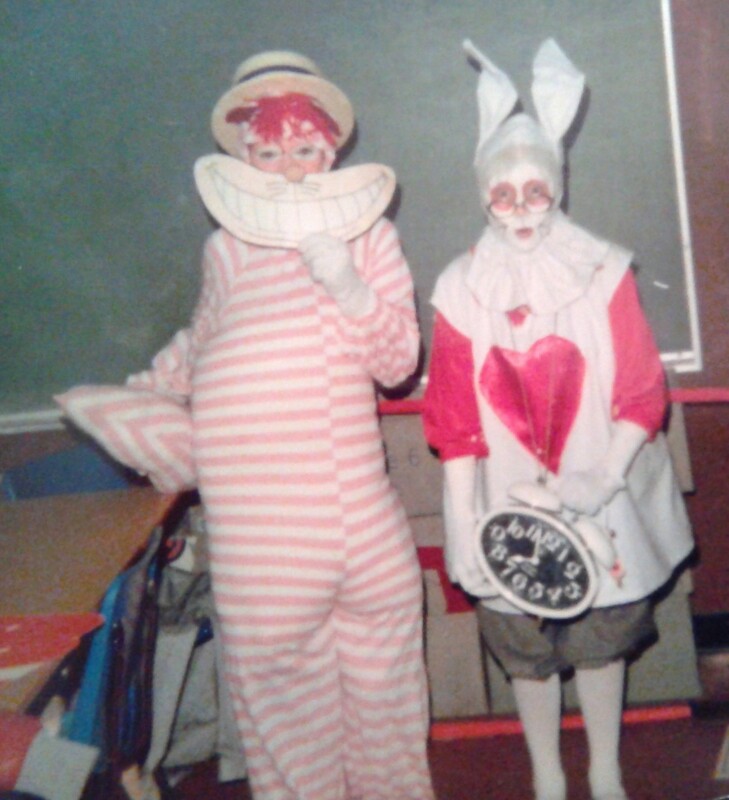 My first role was in the critically acclaimed, Jarvis Elementary School production of Disney’s Alice in Wonderland. You may think (overachiever that I am) that I wanted to play the lead, Alice, but I chose the Cheshire Cat and the way I remember it is that I stole the show with my unique vaudevillian rendering of ‘Twas Brillig. (I was born for hat-and-cane song and dance numbers). From that point on, I was hooked. Like a rabid pitbull on a slipper, I auditioned for every school production, determined to land whichever role I deemed most interesting—sometimes the lead, sometimes a supporting character. Without fail, every part I went after, I got. I was just that good. Or, you know, these were small town suburban schools and the talent pool was limited. It was one of those two reasons. The point is, in a very short time, I came to expect that I would not only get whichever role I set my sights on but that I deserved to get those roles, this was the natural order of things. Musically, I was not a powerhouse and Brigadoon was lyrically difficult. Had I trained for the lead role, I may have landed it but my confidence was soaring and so I went after the juicier, more difficult, comedic role of Meg Brockie. And . . . I flopped. The part I wanted went to one of my good friends, Lisa Waines, who had a far better set of lungs than me and excellent natural comedic timing. The lead role went to my nemesis, Theresa. The only other female role of any significance involved a challenging ballet number and went to the only girl among us who possessed that skill. Where did this leave me? I was stuck in the chorus! In the big production of my final year of highschool, the year I was supposed to shine like the million watt star that I was, I was, instead, Village Woman #6. How could this have happened? When did the universe shift? I had always gotten every part I wanted, that’s how things worked and that’s how they were always supposed to work. I wrote a three page letter to our drama teacher, Mr. Vint, outlining the grave injustice that had been done to me and chastising him for his poor choice of material—in a class where girls outnumbered boys by a ratio of five to one, why would he even consider a play that contained only three female characters of any note? There was much wailing and gnashing of teeth. Through it all, Mr. Vint, lovely man that he was, did his best to soothe my wounded pride but I was having none of it. I DEMANDED JUSTICE. Unfortunately, despite my very valid arguments, I could not change his mind. Mr. Vint was not going to seek out a new female-heavy play at the last minute just to satisfy the class diva. And so I took my place in the back row. The show, as it must, went on. I danced, I sang, I gritted my teeth listening to Theresa’s sub-par Scottish accent, and gritted even more as I listened to the applause she received that should have been mine. And just to rub salt in the wound, I caught Theresa and my boyfriend rubbing up against each other at the cast party later that night. The next day, he dumped me. I’ve spun this tale of woe because I want you to see that however ridiculous my feelings and behaviour seem now, in that moment my despair, frustration, and sense of injustice felt real and no amount of logic could have made me see the light. Today, when I see the shift happening in our western society and the despair, frustration, and sense of injustice expressed by some folks, I think of Brigadoon. The liberal left (of which I consider myself a member but a closer-to-the-center member than most) has taken the lead in many facets of life and the conservative right suddenly finds themselves, in many instances, relegated to the chorus. The Theresas of the world are in the spotlight. It’s only a matter of time before they steal your boyfriends! Something is very wrong. Not long ago, one of my Facebook friends posted a joke about how these days everyone is allowed free speech except Christians, republicans or conservatives. My first reaction was a massive eye roll. Are you kidding me? Just because a growing chunk of the population is no longer interested in what you have to say doesn’t translate to a lack of free speech. If you want to know what it feels like to be truly silenced, talk to any black person who lived in the American south pre-civil rights (or during, or after, actually); talk to any gay or trans person at just about any time in American history; talk to any woman who lived before we received the right to vote or were even considered persons under the law; talk to any atheist or agnostic forced to fake belief or be shunned by those they love. There’s a reason the pendulum has now swung in favour of the liberal left—these people are sick and bloody tired of being silenced. But once the flash of anger passed, I saw that joke for what it really was—this person was Brigadooning. The folks who have had all the best roles, who have enjoyed the spotlight for centuries now, have suddenly been assigned to the chorus. And even though the pendulum will swing back again, and the universe will find balance, right now it’s pretty sucky to be on the right, to be heterosexual, to be Christian, to be a man, to be conservative—even with all the privileges that still exist for those groups. Now, before you tell me not to feel sorry for them because we on the left or those from marginalized groups have put up with far worse for far longer, let me tell you about Mr. Vint. While I was throwing my little diva tantrum over the tragedy of me not getting exactly what I wanted, Mr. Vint remained calm, patient and understanding. He would have been perfectly within his rights to tell me to grow the hell up and quit whining but he didn’t. I don’t know if he realized I would one day figure out what a baby I had been or if he was just kind, or maybe a combination of both, but instead of tough love he just gave me love. And empathy. And an ear when I needed it. Mr. Vint—Colin—and I remained friends after my graduation. I visited his home and met his lovely wife and young kids. I sent those kids goodies from Japan when I was working there and they sent me beautiful handwritten letters in return. 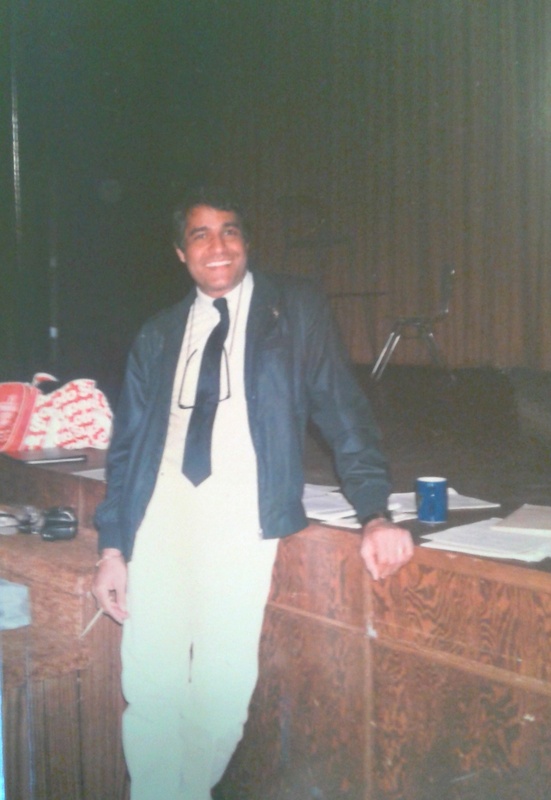 From time to time, when I was back in Canada, I’d stop by while he was teaching and we’d chat and he’d let me jump up on stage and “play” with the students. Though we drifted apart, the memory of the Lesson of Brigadoon never faded. He died of cancer a few years ago and the world lost a dear and compassionate soul. When I look back now on that play, I can see clearly that Theresa and Lisa and everyone else did a great job and there’s room for everyone to take a turn in the spotlight. Even in the chorus, I was part of the show and lucky to be free to sing and dance and entertain our little audience. No matter how “right’ it is for those who have been oppressed or silenced to finally speak up and demand equity and equality and all the rights and freedoms the Other Side has taken for granted for so long, we don’t need to abandon all empathy in the process. I see a growing trend of dog-piling and attacking anyone who even vaguely appears to maybe be offending those on the left. Too often, when someone on the right expresses their feelings it is made very clear that they should shut the hell up because their feelings are wrong. I’ve been guilty of doing this myself, I can’t lie. So, right, left, conservatives, liberals, etc., let’s talk. Folks on the right, I know it feels like the world has turned upside down and everything you hold dear has been branded as bad. It’s frustrating and a little scary when any statement of your beliefs, no matter how benign, could bring down the might of the SJW (Social Justice Warriors, for the uninitiated) upon your head. You’re a good person, so why are so many people treating you like a James Bond villain? I’m sorry you feel this way but, if you can, realize that how you feel now is how many on the left have felt their entire lives, only worse. Pretty lousy, huh? Imagine if speaking freely could not only invite a metaphorical lynching but a real one. However bad you think you have it at this moment, most people on the other side have had it a heck of a lot worse, for decades, centuries, even millennia. It may not seem fair that you feel powerless to defend yourself right now but life rarely deals in fair. I want you to know that even when I leap up on my soapbox of feminism or environmentalism or whatever “ism” I am defending in the moment, I never see you as less deserving of the things you want in life, I merely want a world where the spotlight is shared more evenly. Folks on the left, I know it feels like the other side are a bunch of spoiled divas. Some of them are. And some of them are downright dangerous—yes, Gamergaters, I’m looking at you. But try, if you can, to realize that these people are no different than you, they simply haven’t walked in your shoes yet. They’re only beginning to understand how it is to feel powerless in the wider world and you know very well how that feels, don’t you? Don’t give up the fight but don’t forget that you’re not dealing with James Bond villains, you’re dealing with real people. Fallible people. Worried people. Confused and frustrated people. Attack the problems, yes, but hold onto your empathy…for everyone, not just those on your side. Everyone, don’t let the labels of left and right, liberal and conservative, democrat and republican widen the gap between us. I’m lucky to have good friends on all points of the spectrum and I assure you we all basically want the same things—to be free, to be healthy, to be happy, to love and be loved. We can get there together. Maybe by believing that we can find common ground and make a better future, like the inhabitants of the magical Scottish village of Brigadoon, I’m living in a fantasy world. But I’ve been shown too much love when I didn’t deserve it and I’ve met too many Mr. Vints to give up hope. Colin, thanks for handling my temper tantrum with such grace and kindness. When I see people torn up by the bitterness and cruelty of their past, I say a silent thanks for people like you. I only wish I had told you, while you were alive, what a difference you made. In loving memory of my teacher and friend, Colin Vint. This entry was posted in Entertainment, Friends, News and politics and tagged Brigadoon North Delta Senior Secondary School, Colin Vint drama teacher, Free speech for everyone, how the left and right can get along, peace between left and right, the anger of the conservative right. Bookmark the permalink. If the left is now in the right, why do I feel the right domineering the left? Just tell me that, eh. I think the right is still very much at the wheel, especially when it comes to the corporate world and politics, (though I know many Americans would disagree). However, I feel that, socially, the left has gained a lot of ground and is starting to make its voice heard. The sound levels vary depending on location, but I have friends on the right who feel that the only safe bet right now is just keeping their mouth shut at all times. (There is a big schism between right and left in the SF/F world right now, for example). I’m 100% behind supporting voices that are long overdue to be heard but I draw the line at attacking anyone who even vaguely does not appear to be on their side–something that’s probably far more prevalent in the online world, especially in social media.